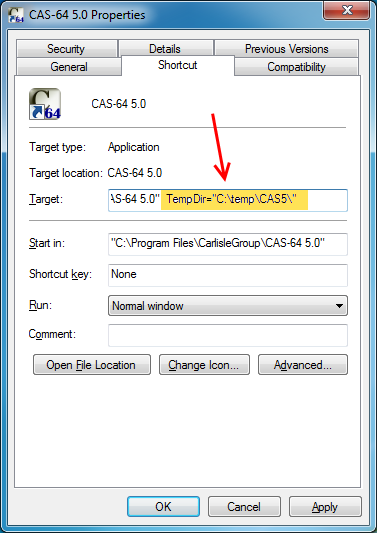 CAS 5 32Bit - "%appdata%\CarlisleGroup\CAS5\Temp"
CAS 5 64Bit - "%appdata%\CarlisleGroup\CAS5-64\Temp"
In certain environments the user application data folder is restricted due to network and user quotas. In this case we recommend using an alternate folder. This can be done by modifying the CAS registry key or the CAS shortcut icon. 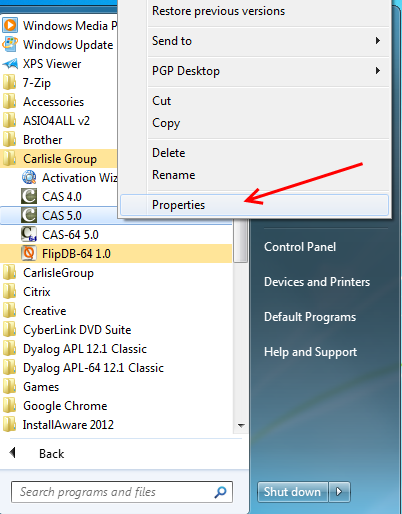 CAS will NOT empty or create the custom temporary folder unless the ForceCreateTempDir flag is set to 1. How to set the ForceCreateTempDir flag. If this flag is not set and the temporary directory does not exist, CAS (5.0.180+) will show a error message on startup. Add the TempDir variable at the end of the Target: path. You will define the custom variable with your desired directory. For example: TempDir="C:\TEMP\CAS5TEMP\"
You will need admin rights to modify your registry. This is the best option when doing a new rollout. Every CAS shortcut will use this value unless the shortcut specifically overwrites the TempDir flag. Find the appropriate key for your version of CAS. Add a new String value and call it "TempDir"
Modify the new "TempDir" value to contain the path to your new temporary directory. 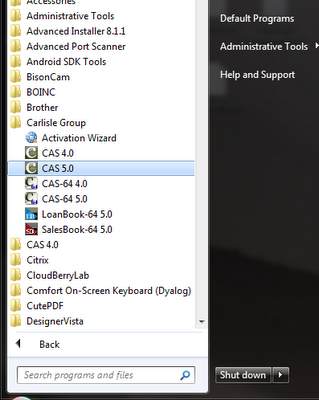 How to check which temporary directory CAS is using.